Tegucigalpa, March 7, 2019 – With all the political struggle now going on in the courtrooms as trials have become a central activity in our movements, there is much to say and much to share from the feminist perspective of the National Network of Women Human Rights Defenders, a veteran in this and other daily battles. 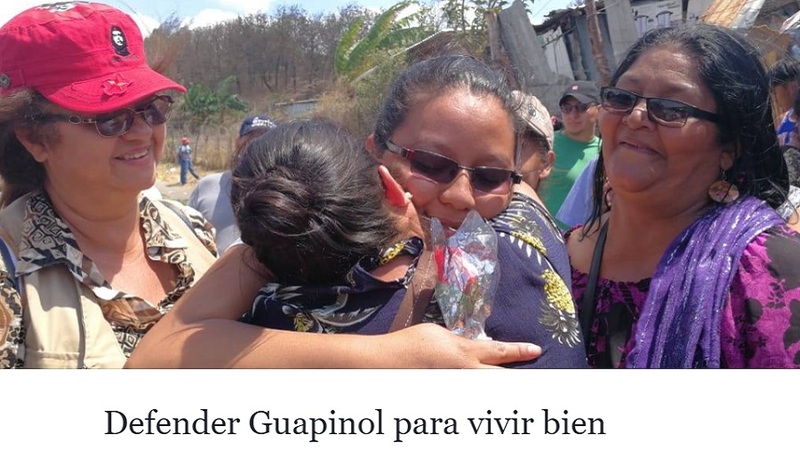 At least eleven days of tireless work and numerous actions were undertaken by a work team and many members of the organization who responded to the call for active solidarity in setting up a resistance camp in Guapinol and, after March 2nd, the feminist Long Live Berta Camp. The camp was originally going to be in Utopía as part of the commemoration of the assassination of Berta, and what COPINH calls the sowing of Berta’s seed, but the regime that persecutes all forms of the dignified defense of collective life in the country obliged the organizers of the feminist camp to move to the paved area outside the courtrooms on La Paz Avenue in Tegucigalpa in an extortion attempt. We got together to reflect on what happened during that time and to share what we learned. Our most powerful conclusion was the confirmation of self-care as a relevant pillar of our feminist proposal and a clear need during days of judicial resistance. People turn to the Network when stress and strain set in and anguish assails those who are resisting. We know all too well that creating such burdens is a policy of the ruling powers aimed at crushing strength and hope. We learned that crises and emotions are as much a part of our struggles as logistics and lawyers, and that sustaining resistance has many dimensions and approaches. We learned that girls and boys need to play and that when they laugh, adults regain strength, that playing outside of a criminalizing courtroom takes on new meaning. We learned the power of an embrace, of massage oil on hands, of body contact resistance, of what each and every one of us had to say. Stay strong, sisters. Stay strong. We are not alone. The circle kept us going. We learned that solidarity come in different forms, sometimes in the food we eat, in coffee, in songs. The beauty of art revealed the vital, aesthetic proposal as the political proposal it is, and drew near to the knowledge and tastes of one and all. A ballad, like a Catholic song, had its space. We learned that the way in which we approach people is crucial in legal proceedings, that information needs to be explained and shared, that the lives of all are important– those inside with their lives on the line and their family and friends who await them with expectant gazes. These are the ways, the times and the attitudes for standing by those on trial according to what each person understands and can do. Ours is the feminist way of enabling laughter and tears, promises, food, desire, fear, and victory.